You may or may not know it, but up in Svalbard, a Norwegian island in the Arctic circle, lies a secure vault buried in the frozen tundra of a remote rock. 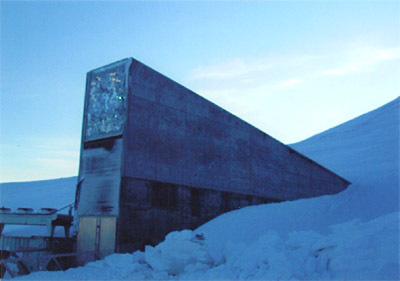 It’s a seed vault, intended to secure the diversity of food crops available to humanity ‘in perpetuity’. In this place seeds no longer wander with their mammalian caretakers, they have left their normal utilitarian habits behind and have been converted into an insurance policy. Australia and Syria have both made deposits, but as one country is already claiming some seeds back for regeneration, in Australia we must acknowledge we have a great challenge ahead in securing our climate resilience and native food security. For the bulk of our existence on this Earth, and on this continent, our species have roamed the land. Lovers of Earth and sky we have moved from place to place, going where the food supply would be most abundant. We carried our tools with us for the next hunt and the next wild harvest, and in our pockets and in our poo we carried our seeds with us. Waiting to be deposited so they could provide for us again in the near future or when we came back around. We are no longer roamers. We have developed and modernised, changed and become more efficient. We have more tools now, used for less purposes. And we have less crops grown for more people. We travel less but adventure farther. And we live closer, lured into cities of thousands and millions, full of light, marvel, smaller backyards and bigger grocery stores. In cities like Melbourne our lives are significantly improved, all of the most useful advancements are at our finger tips and, though our city is young, it provides us with one of the best standards of living on the planet. In Aleppo in Syria, it’s a different story. In Aleppo, one of the world’s oldest cities, bombs from Russian planes have been dropping, putting into jeopardy one of the world’s most important seed repositories. In ICARDA, the International Centre for Agricultural Research in Dry Areas (ICARDA), over 130,000 varieties of crops for drylands agriculture are stored. Many of these varieties are ancient, and are the descendants of the very first human cultivars. Last year 80% of these seeds were sent to the Svalbard vault, locked away far from danger. At the same time Australia also made a deposit. Over 10,000 seeds primarily from the Australian grains Gene-bank (AGG) in Horsham and the Pastures Gene Bank in South Australia. According to Sally Norton, of the AGG, of the 7143 varieties they deposited, 922 were native species, “Truly Australian Material”. None of these however are particularly edible, they are the native wild relatives of our mainstream imported agricultural crops, like pigeon pea, soybeans, cotton sunflower and sorghum. They are the genetic varieties which can help us to adapt crops for our own conditions. The global crop diversity trust recognises that although in Australia we grow 93% of our own food, 88-100% food energy consumed in Australia comes from non native crops. This is the food that fills the shelves of the supermarkets in our cities. In fact we have only one major commercial native crop; macadamia nuts. In contrast though, it is believed that up to 80% of indigenous diets, prior to colonisation came from plant material and that we in this country have at the very least 700 edible native plants. These edible plants though were not what Australia deposited into the Seed vault in Svalbard, what we deposited there were crop plants, plants that can produce seeds which can be dried down to 5% moisture and stored in -18 degrees celsius. Of all the edible plants in the world there are only so many which can survive this way, and while they are important, they are by no means everything. They do not include, bananas, tarot, sweet potato and many more. Australia is one of 12 mega-biodiverse countries on the planet and 5th overall for plant biodiversity. If we are going to secure this biodiversity and with it our own resilience we need a diverse strategy, not just seeds locked away in vaults but also native plants and species in our own backyards. These opportunities are available to us and with them we might just be able to improve our diets, wildlife, local habitats and species. There are books out there for us to read, like “Flora of Melbourne” which provide us with details on native species and their usefulness. If food security is important enough to build a vault in Norway for then maybe it’s also worth us planting a few more local varieties in our backyards as well?